Can you accommodate short notice? Yes, I can usually accommodate short notice request. Please call for any quick notice wedding needs. 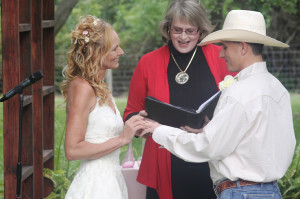 There is no charge for ceremonies within 50 miles of Corpus Christi, Texas. A $75 deposit will secure your date, cash or check. The remaining balance due at least 2 weeks before the wedding ceremony. Credit card, money order or cash only. There is no refund of your deposit. Your event can be rescheduled. Please post comments if you have any wedding service questions. If you would like a more direct approach email or call Becky at 361-537-2159. My fiance and I are looking for an officiant for our upcoming wedding Oct. 24, 2014. We would love to meet with you if possible. We are both living in Kingsville but our wedding will take place in Corpus Christi. Would you be available to meet with us Saturday morning or possibly next Wednesday? Please let us know what would work for you. I was going to ask you if you’re available outside of Corpus Christi. Not sure why the previous comment didn’t show up. Thanks.